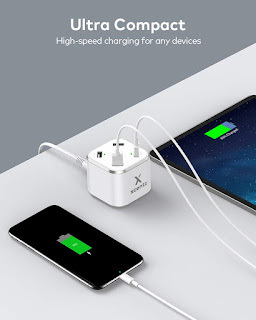 High Speed Output: charge any USB C device at high speed with 5V 3A type C charging port; Charge compatible device up to 80% in 35 minutes with quick charge 3.0 port. Superior Safety: Multi-protection system shields everything from overload, short-circuits, over-current and other charging issues. ETL Certificated, Worldwide 100-250 volt AC input voltage. Premium Design: Unique & compact cube design, keeps your desktop organized. Best idea to purchase this USB charging station for yourself or as gifts. Worry-Free : Our products are built to last, which is why we offer an industry-leading 18-month warranty, no-questions-asked. Please feel free to contact us and we will give a satisfied solution within 24 hours.